Submitted by mark on Saturday, November 3rd, 2018 at 7:48 am. 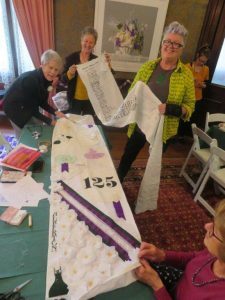 A community art workshop commemorating 125 years of women’s suffrage will take place at Clendon House in Rawene on November 24 (9.30am-4pm). The art workshop will be led by Dunedin artist Janet de Wagt, and is funded by a Creative New Zealand Grant, with support from Heritage New Zealand Pouhere Taonga. Participants will create a commemorative banner that will be joined with other banners made in other workshops at key heritage locations around the country over the next few months. The banners from the art workshops will be amalgamated into one final artwork which will be launched at Old Government Buildings in Wellington in April next year. “The banners are a reference to the three Parliamentary petitions that were circulated around the country and which ultimately resulted in women finally being granted the right to vote on 19 September 1893,” says Lindsay Charman, who is the Senior Visitor Host for Clendon House, which is cared for by Heritage New Zealand Pouhere Taonga. The ‘Monster Petition’ survives, and contains 25,519 signatures – including some men. The roll was presented to Parliament with great drama. Sir John Hall, Member of Parliament and suffrage supporter, brought it into the House and unrolled it down the central aisle of the debating chamber until it hit the end wall with a thud. Clendon House is a fitting venue for the workshops according to Lindsay. Jane Clendon – the daughter of Dennis Cochrane and his wife Takotowi from the Hokianga – was a woman of considerable strength. “She also had significant blood lines and mana – though she found herself almost bankrupt with a large family to provide for after the death of her husband in 1872. Many people facing such pressure would have gone under, but Jane – who was only 34 years old with eight children under 17 – rode to Auckland on horseback and managed to skilfully negotiate terms of repayment with her creditors,” he says. Artistic ability is not necessary for people to take part in the workshops – and Janet de Wagt is looking forward to working with a range of different ideas and skills. All art materials are provided for at the workshop. “Participants in the banner-making will be able to use painting, printing, stamping, drawing and weaving – whatever they prefer – to create the banners,” says Lindsay.